Tasty, Potent Mango Cream Marijuana in Autoflowering & Photoperiod Strains – Growing Marijuana Perfectly! Growing Your Own Marijuana is Always Better! Marijuana and mangoes contain ß-Myrcene (myrcene), a compound that has medical effects. Myrcene is a well-known cannabis terpene because it potentiates the effects of cannabinoids and terpenoids. It’s a building block for additional cannabis terpenes. So, when you grow cannabis strains that have the word “mango” in their name and have a distinctly mango taste and scent, you’ve got a strain high in myrcene. This compound accentuates cannabinoid effects because it defeats the evolutionary brain-protecting function that slows transfer of substances from the blood to the brain. This allows cannabinoids to transfer into the brain faster and more efficiently, leading to rapid onset of cannabis effects. Cannabis lore suggests eating a couple of mangoes an hour before getting high to make the high stronger and longer lasting. Myrcene is known to augment THC and/or CBD effects, and to accentuate medical marijuana benefits including sedation, pain relief, anti-inflammatory properties, anti-seizure, anti-cancer and anti-diabetes. Myrcene-rich strains tend to be Indica or Kush, and can produce a heavy high leading to extreme relaxation or sleep. You rarely find high myrcene levels in sativa cannabis strains. The Exotic Seed cannabis seed company decided several years ago to make myrcene-rich mango photoperiod and autoflowering cannabis strains. 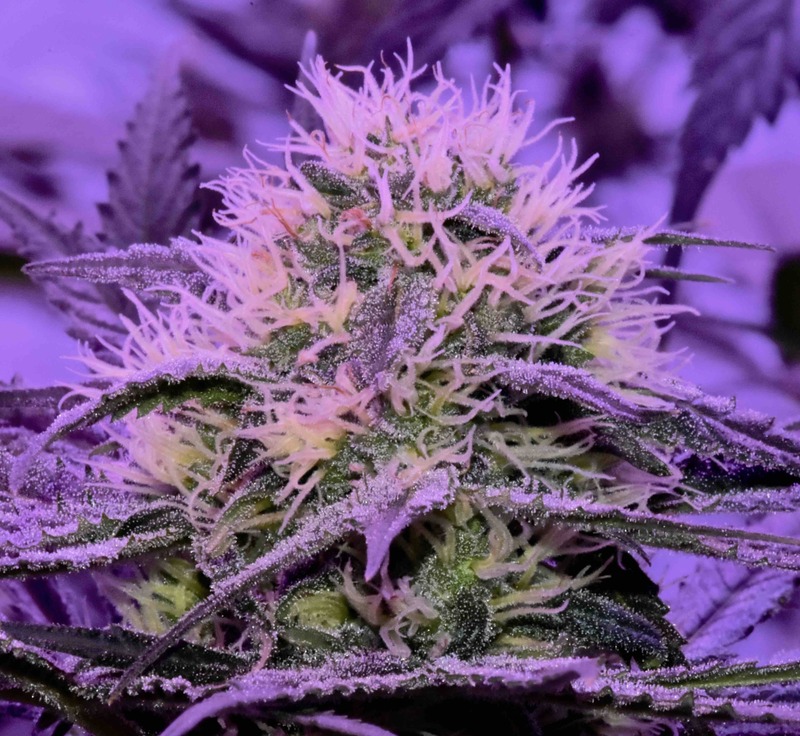 Exotic Seed is a European cannabis breeding consortium using Dutch, North American and Spanish breeders to create stellar high-performance strains nobody else has. Most people in North America haven’t heard of them yet, but they’re very popular with European growers and have won awards at every cannabis competition event they’ve entered. Today, we’re sharing with you one of their gourmet award-winning strains—Mango Cream. We’ve only grown the autoflowering version of this strain, which also comes in non-feminized and feminized photoperiod strains. All versions of Mango Cream share the same elite genetics: a cross between Somango, Blueberry and New York City Diesel (NYCD). In those three strains you get a dizzying array of foundational cannabis genetics. For example, NYCD contains Skunk, Afghani, Hawaiian, and Northern Lights genetics. Somango is comprised of a rare Asian cannabis strain crossed with the legendary Jack Herer strain, which means there are Haze genetics onboard. Blueberry is a legendary, tasty, potent strain that has been around for decades. To make Mango Cream Auto, Exotic’s breeding scientists inserted some Ruderalis genetics into its photoperiod Mango Cream to create a feminized autoflowering strain that goes from seed germination to harvest in 65-77 days. The strain grows into a dense, sturdy plant with a symmetrical Christmas tree shape, short internodes and thick buds. In the pic accompanying this article, you’re seeing a Mango Cream Auto bud that still have two more weeks to add resin glands before harvest. We had Mango Cream Auto on a high-intensity feed program including Connoisseur pH Perfect base nutrients and several bloom phase supplements: Bud Ignitor, which creates more budding sites and faster development of buds, Bud Candy, which sweetens the buds, Nirvana, an all-natural booster that potentiates resin gland development, and Big Bud, a phosphorus and potassium bloom booster with optimum ratios of both elements. The plants handled the nutrients well, with dark-green foliage reminiscent of pure Afghani Kush. The strain smells like mango, skunk, diesel, and a sweet dessert, and that’s what it tastes like too. The yield is impressive, especially for plants that grew only 36-47 inches tall and were ready for harvest before three months of growing had passed. The average yield per plant was slightly less than four ounces, but the largest plant that took the longest time to be ready for harvest yielded five and a quarter ounces. I can see Mango Cream Auto as a kind sea of green or stealth outdoor strain, for sure. Because these are thick Indica-dominant buds, keep your grow room humidity between 51-55% during peak and late bloom phases, and keep a close eye on the inner stem of each bud where gray mold likes to develop. If you’re growing outdoors in humid or wet climates, keep a close eye on your buds. Some of us found Mango Cream Auto buds too potent to do anything other than relax, get a massage, make love, or sit in a hot tub after vaping. It’s a sweet, strong high with medical effects such as anti-anxiety, anti-insomnia, pain relief, and stress-buster, but it’s not the kind of Kush or Indica that makes you comatose. If you love mango marijuana and Indica, the award-winning Mango Cream is the ticket for you. We also suggest you look at the rest of the Exotic Seed marijuana seeds catalogue. These good people are super honest, hard-working and dedicated European cannabis seeds breeders. We’ve grown several of their strains, and each one was unique, exactly as they described it, and provided lots of fun and medical relief. Pingback: Marijuana Strain Review: German Musical Artist Teams With Cannabis Seeds Artist to Make Potent Weed – Growing Marijuana Perfectly! This entire website, all photos, headlines, text and other information, is copyrighted intellectual property and can’t be reproduced except with the explicit permission of Growing Marijuana Perfectly.